Does Your Horse Trust You? Trust and like are two very different qualities, especially when it comes to your horse. Many horses like but don’t always trust their owners. Well-known horsemanship clinician Tom Dorrance feels that a horse’s trust for his owner is the foundation of the relationship. If your horse doesn’t trust you then his instinct for self-preservation will supersede everything else, which means that in a scary situation he will tend to react based on instinct rather than turning to you for guidance. This kind of lightning-fast reaction can easily injure you or your horse. A horse’s lack of trust can also show up in less volatile situations. A horse has three basic needs: to be cared for, protected, and comforted. Each time you fail to meet one of these needs your horse will feel that he is alone and that he can’t trust you—a dangerous feeling for a herd animal. In response, you horse is likely to buddy up with other horses and may become barn sour or develop other behavioral issues. A horse with trust issues will often have digestive and immune system weaknesses. On the training front, not taking the time to build an initial foundation of trust can result in problems such as running through the bit, balking, rearing, or bucking. So how do you develop this all-important foundation of trust with your horse? Unfortunately there is no simple answer. Luckily there are some good places to start including developing leadership skills, improving your horse’s balance, and controlling your horse’s fight or flight instinct. When you develop a relationship with a horse you become a part of his herd, so it’s important to establish yourself as the leader of that herd. A horse who is unsure of your leadership will continually test you. This testing could be as subtle as nudging you with his nose or as blatant as walking all over you. The question is whether you can pass the test. You may think you are being kind when you ignore your horse’s attempts to invade your space, but in reality you are causing him to be unsure of his position in the herd. Correcting your horse when he invades your space is not about punishment but about giving clear and consistent direction about which kinds of behavior are acceptable and which are not. More sensitive horses will back off in response to light pressure while others will require a much stronger form of correction. The goal is to offer enough correction to prevent the horse from testing your leadership again; otherwise you are just nagging your horse and will have correct him over and over. Once your horse is clear about who is in charge, he will relax and begin to trust you. As a prey animal, your horse will feel uncomfortable unless he knows that he can move quickly and efficiently to escape from predators, regardless of the fact that he no longer lives in the wild. You can help your horse feel safe by helping his body stay supple and balanced over all four feet. For instance, take the time to correct your horse when he tries to push you around while you are on the ground, or when he leans around a corner under saddle. The indications may be subtle, but these small moments of being off balance can actually cause your horse to feel uncomfortable and unsafe. You can help your horse feel safe and secure with proper ground work and exercises under saddle that teach him to use his body in the balanced way. Eventually, your horse will begin to associate these good feelings with you, and will be well on his way to trusting you. Horses are easily frightened. If your horse becomes frightened and you allow his fear to escalate unchecked, he can easily become a danger to himself or others. A horse’s natural fear response is to raise his head, drop his back, and tense his muscles in preparation for flight. In a natural setting, he would then run until he was out of danger, and then relax and resume grazing. You can actually use the last step of this instinctive sequence to diffuse your horse’s fear response. When your horse becomes fearful, simply encourage him to lower his head. When a horse lowers his head and assumes the grazing posture, he automatically relaxes. 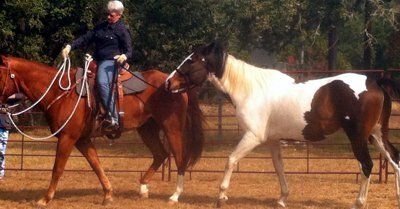 With practice, you can teach your horse to lower his head on cue. More importantly, your horse will begin to associate you with this feeling of relaxation, another piece in the foundation of trust that you want to build with your horse. Training and riding skills are very important in working with horses, but at the end of the day nothing is more important than trust. It’s important to spend time with your horse and get to know the different facets of his personality. However, time alone will not create trust. Unless you establish and continuously establish your position as leader, protector, and comforter, the time you spend with your horse will not necessarily result in trust. Ultimately, nothing is more important to the relationship than how your horse feels when he is with you.